Unfortunately almost nothing is known of George Ostler's early life, simply because there were at least four, possibly five, men called George Ostler who were born in Yeovil around the late 1860s. Confusingly George was reportedly aged 49 when he died (that is, being born in 1867) but most records seem to indicate that he was born in Yeovil in 1874 (that is, he was actually 42 when he died). In any event he spent his childhood in Yeovil and probably got a job working on the railways. In the 1891 census he was listed living with his older brother William and his family in Swindon. William worked as an engine lighter and George worked as an engine cleaner. In the spring of 1894 George married Bessie Michell (b1876, Plymouth, Devon) at Newton Abbot, Devon. They initially lived at Newton Abbot, where their son Leslie was born in 1900, before moving to Exeter where their other children were born; Gladys (b1901), Dorothy (b1903), Gordon (b1907), Rupert (b1908) and Dulcie (b1910). The family were recorded at 23 Brunswick Street, St Thomas, Exeter, Devon, and George gave his occupation as an engine driver for the Great Western Railway. George moved his family back to Yeovil shortly thereafter to live in Newtown at 10 Westville. George enlisted in Yeovil, joining the Corps of Royal Engineers. His service number was 189131, suggesting he enlisted during late 1915 or early 1916. Because he was a railway engine driver in civilian life, it is not surprising that George was posted to the 19th Section, Railway Operating Division (ROD) of the Royal Engineers. 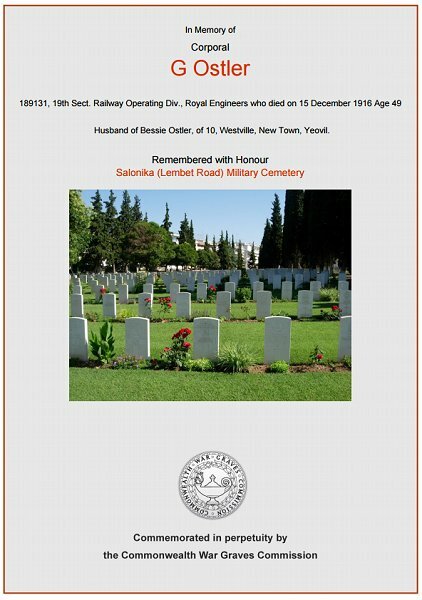 The fact that he was posted to Salonika, Greece, means that he was either in the 107th Light Railway Operating Company or the 133rd Light Railway Operating Company of the ROD - being the only two of the 45 or so companies of the ROD to serve in Greece, the others serving in France. Both theses companies were part of 26th Division which had moved from the Western Front to Salonika in November 1915, where it was to remain for the rest of the war. During the Great War extensive use was made of narrow gauge light railways which used troops, horse and mules, as well as engines, to move munitions to forward positions. They were also used to evacuate wounded soldiers from battlefield dressing stations to a Casualty Clearing Station (CCS) further behind the lines. They are mainly associated with the Western Front, but were also exploited to a lesser extent in Italy, Salonika, Egypt and Palestine. In October 1914, the Railway Executive Committee in England had formed a Sub-Committee for Recruiting. Very large numbers of the employees of British railway companies were then volunteering for military service and the men for RE Railway units were selected from them. By the end of 1917, out of 180,000 enlistments from English railway companies, about 40,000 were serving in RE Railway units, including George Ostler. From October 1915 to the end of November 1918, the British Salonika Force suffered some 2,800 deaths in action, 1,400 from wounds and 4,200 from sickness. The action of the Commonwealth force was hampered throughout by widespread and unavoidable sickness since on one front there was a wide malarial river valley and on the other, difficult mountain ranges. Corporal George Ostler is known to have been hospitalised due to enteric fever. 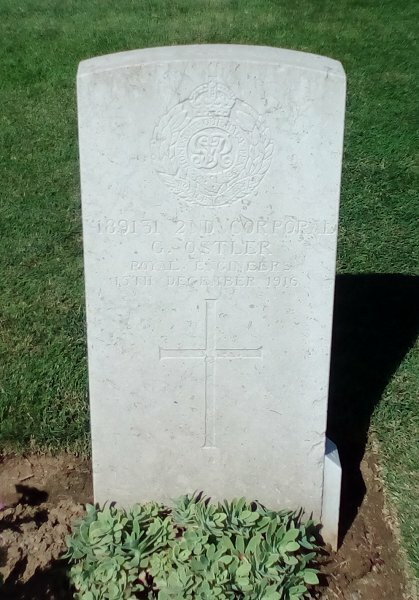 He died on 15 December 1916, aged 42. In its edition of 29 December 1916 the Western Gazette reported "News has been received by Mrs G Ostler, of Southville (actually 10 Westville), Eastland Road, on the death in Salonica of her husband, Sec. Corpl. G Ostler, of the Royal Engineers, from enteric fever. Sec. Corpl. Ostler, who had only been on active service a short time, leaves a widow and seven children, with whom much sympathy is felt." George Ostler was buried at the Salonika (Lembet Road) Military Cemetery, Salonika, Greece, Grave 731. Hi name is inscribed on the Yeovil War Memorial in the Borough. The Commonwealth War Graves Commission certificate in memory of George Ostler.